Have you ever wondered how you could control the air conditioning and heating in your space better? At Fusion Heating, Air Conditioning & Insulation, we provide ductless heating and air solutions so you can control each individual room in your home without expensive complicated multi-zone traditional HVAC units. This means that when a room is not being occupied, you don’t have to waste money and energy keeping it cool or warm or install additional duct work in your home or building. With this, our Chesapeake Ductless HVAC specialists can provide full solutions to your problems. We are a Mitsubishi Diamond Certified Contractor, one of only a handful in the state of Virginia. Through our experience, specialized product knowledge, and Mitsubishi backed factory expertise we understand how to help save you energy and money while delivering a truly customized HVAC solution room by room with a less complex installation. Ductless HVAC is the next generation in HVAC solution. 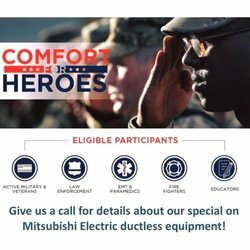 We invite you to give us a call for a free consultation on our wide array of Ductless solutions to learn more about how this unique solution may be right for your home or office. Call (757) 295-8305 for your free estimate with our team. Wider Array of Expertise and System Knowledge Than Typical HVAC Companies Who Only Do Basic Heat Pump Repair. Are you interested in installing a ductless system to improve your home? At Fusion Heating, Air Conditioning & Insulation, we are dedicated to providing you with the best possible solutions designed with your needs in mind. This cost-efficient method helps you now and in the future so you don’t have to worry about your AC or heating unit costing you extra on rooms that are empty. We have over 25 years of experience and have the knowledge to provide full solutions, not quick fixes. Most HVAC companies handle just the bare minimum. We combine our knowledge of HVAC, insulation, and ductless systems to provide you with a broad range of services you can trust. Don’t wait to experience the difference with ductless systems. If you have a building in which multiple rooms are unoccupied at a time, you can add comfort save tons of money that is normally spent on wasted energy. Our systems are backed by a one-year customer satisfaction guarantee so you can be sure you are receiving the best possible service available. Our HVAC specialists are here to help you with high-quality care. To learn about ductless, mini-split pumps click here. Ready to get started? Call (757) 938-6709 today.